Derry's Clock is situated behind the Theatre Royal. It was before the Second World War at a major junction of George Street, Union Street, Lockyer Street and George Place and was regarded as the centre of Plymouth. All the trams and buses terminated nearby and it used to be said that 'Marriages may be made in heaven but in Plymouth they are arranged under Derry's Clock'. It has its origins in 1862 when William Derry (1817-1903), a local businessman, presented the Town with a clock worth £220 and a half of the cost of the coloured limestone tower in which to display it. Unfortunately the local authority could only perform those functions delegated to it by Parliament, as today, and they did not have authority to construct a clock tower. However, they did have powers to build a fountain, so they included three fountains and went ahead with the construction. Thus, although known as Derry's Clock it is officially a fountain, although it has never been linked to any water supply. Bank of England Place is behind the tower. A Mr Henry Hall of London, was the architect while it was built by Messrs Call and Pethick of Plymouth, who started work on the tower on August 8th 1862. The townspeople raised £300 for the erection of the tower, Mr Derry paying the remainder. The clock was made locally by Messrs Page, Keen and Page and had 4 illuminated dials, each 4 feet in diameter. It was constructed to run for 8 days before a re-wind. The pendulum was 15ft in length with a one hundredweight ball attached to the bottom. Every hour will be sounded by a bell weighing two hundredweight. There was growing dissatisfaction about the accuracy of the public clocks in the Three Towns and in 1920 a new electronic clock was installed in the Derry's clock tower. Mr J P Brown paid for the installation and the clock was made, like the original, by Messrs Page, Keen and Page. It was a replica of the largest electronically driven clock in the world, which was that on the Liver Building in Liverpool, although the Plymouth one only had dials of 4 feet whereas the Liver one had dials of 25 feet. It was fitted with a controlling apparatus known as the "Pulsynetic" system, by which it was linked electrically direct with Greenwich in London. It was set at 10am each day. An advantage of the new system was that it allowed for extra power to be applied to the hands in adverse weather conditions, such as high winds, snow or heavy rain. Thus the clock should be more accurate. After repainting the dials and inserting the words "Greenwich time" on each face, Derry's Clock was re-started at 11am on the morning of Friday October 1st 1920. 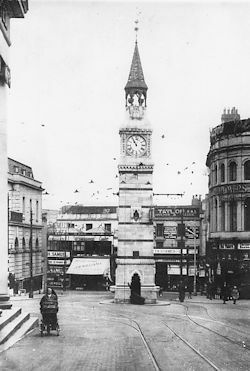 Derry's Clock, Plymouth, in its original environment. According to his descendant, Mr Tony Pitt, during the 1930s and 1940s Mr Edgar William Robert Broad (1894-1992), a member of the staff at Messrs Page, Keen and Page, was apparently dragged from any New Year's party he was attending and rushed by taxi to Derry's Clock to ensure that the clock was synchronized with the midnight Greenwich Time Signal. Although now obscured by the more modern buildings that surround it, the tower is held in such high affection by true Plymothians that suggestions to have it moved to another more prominent position have always met with strong objections. It is now one of the few things in the City that is still on the same site as it was before the destruction of the Second World War.